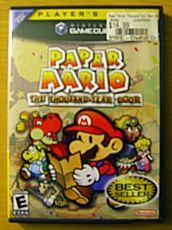 This iteration of Paper Mario was released for the Nintendo Gamecube in 2004. Paper Mario has the same general plot as other Mario games: Bowser kidnaps the princess Peach, and Mario must rescue her. Featuring much of the style of previous Paper Mario games, the worlds through which Mario adventures are apparently made of paper. Objects are two dimensional, and even Mario himself is as flat as a sheet of paper. This comes in handy for the mustached-hero, having to use his two-dimensionality to complete challenges. This incredibly fun game features RPG style combat, where Mario has a team of cohorts to help him fight enemies, tackle obstacles, and provide helpful hints along the way. By fighting each of the world's bosses, Mario gains crystal stars, which ultimately lead him to the princess.